PT Bank Negara Indonesia (Persero) Tbk - BNI or referred to as "Bank BNI" is a well-established and reliable public-listed company in Indonesia, running business in banking industry. Bank BNI has its business activities focused in personal banking, priority banking, business banking, international banking and treasury. Bank BNI was founded in 1946 and recognized as the first state=owned bank that was established afrer the independence of Indonesia. As today, Bank BNI is positioned inside the top four of Indonesian banks in terms of assets. According to Bank BNI Annual Report 2015 as cited by JobsCDC.com, PT Bank Negara Indonesia (Persero) Tbk managed to record total assets of Rp 508.6 trillion as at the end of December 2015. 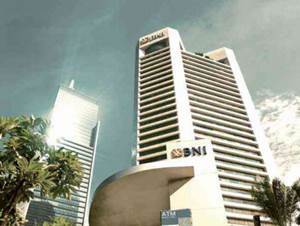 As a state-owned bank, Bank BNI is controlled by the Government of Indonesia. At present, Bank BNI — whose shares are traded on the Indonesia Stock Exchange (IDX ) under the code BBNI — is 60% owned by the Government of Indonesia and 40% by investors. Headquartered in Jakarta, Bank BNI runs its business through 15 regional offices, 169 branch offices, 911 sub branch offices, 545 cash offices, 105 payment points, 81 mobile banking units, 1,826 outlets, 16,071 ATMs and 6 overseas offices located at Singapore, Hong Kong, Tokyo, Osaka, London, and New York. Willing to be bound by the contract / target. Domiciled at Banjarmasin and Banjarbaru. JobsCDC.com now available on android device. Download now on Google Play here. Please be aware of recruitment fraud. The entire stage of this selection process is free of charge. 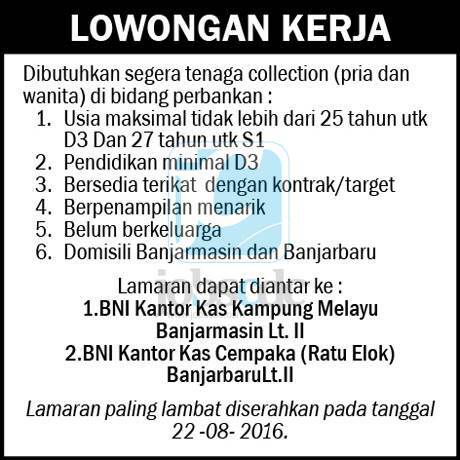 PT Bank Negara Indonesia (Persero) Tbk - Recruitment D3 Collection Staff BNI August 2016 will never ask for fees or upfront payments for any purposes during the recruitment process such as transportation and accommodation.